Lydia (Gaumer) Shirer was born on either May 30 or June 24, 1803 in Southampton Township, Somerset County, the daughter of Daniel and Hannah (Baughman) Gaumer Sr. As a young girl of about age five, she relocated to Ohio with her parents, sisters and brothers, settling on a farm near Adamsville in Adams Township, Muskingum County. On July 28, 1822, when she was age 19, Lydia married 29-year-old David Shirer Sr. (1793-1868), also originally from Southampton Township, and the son of Valentine and Elizabeth (Kirby) Shirer Sr. They were separated in age by a decade. The nuptials were the first ever held in Adams Township, according to J. Hope Sutor's 1905 book Past and Present of the City of Zanesville and Muskingum County, Ohio. The Shirer and Gaumer families were close, as David's brother Valentine Jr. successively married Lydia's sisters Catherine and Esther. David came to Ohio as a boy of age 12. The Shirers produced 10 known children. Among them were Levi Shirer, Thomas Shirer, Elizabeth Plank, George W. Shirer, Peter Shirar, Mary J. Cline, Charles Shirar, Lewis Shirer, Rebecca Ann Shaffer and a baby daughter who died at the tender age of 14 days on July 21, 1834. The infant's remains were lowered into repose in New Hope Lutheran Church Cemetery. The 1860 census enumeration shows David, Lydia and son Lewis residing together in Camden, Jackson Township, Carroll County, with David's occupation listed as "retired farmer." During the Civil War, their sons Charles, Peter and Lewis joined the Union Army. Tragically, Lewis sacrificed his life for the cause, but the details are not yet known. In the aftermath of his death, no claim apparently was filed for a pension as compensation for his loss. Sadly, David passed away in 1868 in Jackson Township, Carroll County. His remains may rest in the Shirar and Landes Cemetery in Monroe Township, Carroll County. Circa 1913, the Shirars' old farm was owned by D.E. Allbaugh. Son Levi Shirar (1823-1891) was born on May 24, 1823 in Adamsville, Salem Township, Muskingum County. When he was about 22 years of age, in 1845, he relocated with his family to Carroll County, IN. There, on June 4 or 24, 1848, he was united in wedlock with Salinda "Celinda" Albaugh (1826-1890), daughter of John Albaugh of Camden, IN. Their 10 children were David Shirar, James "Riley" Shirar, John Bartholomew "J.B." Shirar, Sarah Jane Walker, George W. Shirar, Thomas Nathan Shirar, Nancy Elizabeth Kennedy and Rebecca A. Garner and two others who died young. In 1860, the family dwelled on a farm in Camden, Monroe Township, Carroll County and were next door neighbors to Levi's brothers Thomas and George and their families. The Shirers pulled up stakes in December 1867 and relocated to Kansas, where they and Levi's brother Charles and family settled on a farm in Wakarusa, Douglas County. The site was near the poor farm. The Shirars are listed there in the 1870 census enumeration. That year, 11-year-old George Washington Gaumer -- son of Peter and Elizabeth (Albaugh) Gaumer -- made his home with the Shirers. Levi and Salinda were founding members of St. Paul's Lutheran Church of Mentor, Saline County, KS. The couple left the Wakarusa farm in March 1882 and moved to Saline County, KS. In November 1890, ailing with kidney disease, Levi traveled to visit his son David and daughters Mrs. Alex Walker and Nancy Kennedy in Lawrence. The gossip columns of the Lawrence Gazette said that he "has been in bad health but is improving. He will probably remain all winter and may move back to his old home in Douglas county." Son James "Riley" Shirar (1852- ? ) was born in about 1852 in Carroll County, IN. At the age of 15, he relocated to Wakarusa, Douglas County, KS with his parents, siblings and at least one uncle and aunt. He married (?). They had at least two daughters, Mrs. Charles Wheaton and Jennie Leary. At the age of 27, in 1879, he provided a general affidavit in support of his uncle Charles Shirar's efforts to obtain a Civil War soldier's pension. Living in Walnut Township near Salina, Saline County, KS, Riley was a farmer, "with a favorable prospect for a good yield of apples," said the Saline County Journal in May 1883. "He is engaged in preparing a good cellar for them under a fine stone dwelling." He and a number of his brothers and cousins in June 1885 joined the Kansas National Guard, Company B. In October 1920, the Lawrence (KS) Daily Journal-World reported that he had "a fine farm on the Wakarusa" near Lawrence and "has been enjoying a vist [sic] from his brothers, David Shirar, of California, and J.B. Shirar, of Salina, and his sister, Mrs. R.A. Garver, also of Salina. In politics, Riley was a Republican and served as a justice of the peace in Saline County in 1886. Riley made news again in March 1893 in the Gypsum Advocate, reprinted in the Cherryvale (KS) Weekly Republican: "Riley Shirar, of Shirar neighborhood, came to that locality twenty years ago, a young man, and settled on an upland farm, considered an experiment in Saline county at that time, married a neighbor's daughter, and made a success of his experiment in farming. He has learned enough at straight farming in that time to secure him a handsome property in the city of Lawrence and the farm home of his boyhood near that city, and has a few hundred dollars left. he has lived comfortably and well in the meantime. But he was a man of robust health and good habits." He bought and then rented out a farm along the Wakarusa River, and in April 1900, at a time when it was occupied by tenant Charles Wheedon, it burned to the ground. Daughter Jennie Shirar married Ernest Leary of Wakarusa in October 1905 under "the full Lutheran ceremony" conducted by Rev. Stauffer, said the Lawrence Daily Gazette. Riley had an eye toward the future, and in early 1912 he and his cousin Charles Gaumer were influential in having a rural telephone line installed in Wakarusa, which only served nine farming families, but which "enjoys the distinction of being the most model telephone line in Kansas," reported the Daily Gazette. "It replaced an old zig zag line which rendered unsatisfactory service and was costly to operate. The new line gives central energy service. There is no necessity for wasting time trying to ring central. The moment a receiver is lifted from the hook central responds." Daughter Sarah Jane Shirar (1857- ? ) was born on May 22, 1857 near Camden, Carroll County, IN. When she was age 11, in 1868, she migrated to Kansas with her parents and siblings. She joined the Lutheran Church in about 1872, when she was 15. Then at the age of 21, on Nov. 20, 1877, she was united in holy matrimony with William A. Walker ( ? - ? ). They produced three children -- Charles M. Walker, Will W. Walker and Nettie Krum. Sadly, son Charles died in infancy. "After her marriage," reported the Lawrence (KS) Daily Journal-World, "she joined the Fairview Methodist church in which community she lived, thinking her help and influence were needed there. She was a member of the W.F.M.S. of that church and was an active worker in that as well as Sunday school and church work." Sarah Jane and William moved into the town of Lawrence, KS in about 1914 and lived there for five years until Sarah Jane's passing. As her health slipped away, she asked that her funeral be preached on the fourth chapter of II Timothy: "I have fought a good fight, I have finished my course. I have kept the Faith." She died at home in Lawrence at the age of 61 on Feb. 26, 1919. An obituary was published in the Daily Journal-World. Son Will W. Walker and daughter Nettie Krum and her husband C.C. Krum resided in Lawrence in 1919. Will married Kate McClintock, daughter of A.H. McClintock, with the bride wearing orange blossoms sent by the groom's uncle David Shirar of southern California. Son George W. Shirar (1858- ? ) was born in about 1858 in Carroll County. Daughter Rebecca A. Shirar (1864- ? ) was born in about 1864 in Carroll County, IN. She is thought to have married R.A. Garver ( ? - ? ) with their home in 1891 in Cottonwood, MT. By 1919, she may have married C.E. Garver and dwelled in Pasadena, CA. Nothing more is known. Son Thomas Shirer (1823-1885) was born on Oct. 21, 1823 in Salem Township. When he was about 23 years of age, in 1846, he relocated with his family to Carroll County, IN. In a ceremony held in Carroll County, he married Sarah Plank (1831-1891) on June 15, 1848. They had four known children -- Elizabeth Ann Rice, Clarissa J. Tyler, Emanuel Shirar, Henry S. Shirer and Harvey Shirar. Thomas and family were members of St. Luke's Evangelical Lutheran Church and in 1858 he donated a tract of land for construction of a house of worship. This is mentioned in the 1882 book by Thomas B. Helm, entitled History of Carroll County, Indiana. In 1860, census records show that they were farmers and lived next door to Thomas' brothers George and Levi and their families in Camden, Monroe Township, Carroll County. They remained in Monroe through the decade of the 1860s and are shown there in 1870, with 20-year-old William H. Tyler boarding in their home and laboring on the farm. Thomas died at age 62 in Monroe Township on Feb. 21, 1885. The cause is not yet known. Interment was in Shirar Landes Cemetery in Flora. Sarah outlived her husband by six years. She passed away in Monroe Township on July 27, 1891. Daughter Elizabeth Ann Shirar (1849-1941) was born n May 28, 1849 near Camden in Carroll County, IN. At the age of 18, on Feb. 27, 1868, she married Cornelius Rice ( ? -1922), in a ceremony taking place in her home county. The couple produced three children -- among them Charles W. Rice and Mrs. Rex Gilbert and a daughter who died as a baby. They also brought two other children into their home and raised them as their own -- Phillip Wecharn and Addie Clevenger Tyler. Elizabeth was a member of the Poplar Grove United Brethren Church and the Rebekah Lodge of Young America. "She was well known and held in high esteem by all who knew her," reported the Kokomo Tribune. Cornelius passed into eternity on Jan. 18, 1922. Elizabeth survived as a widow for 19 years. she died at home in Ervin Township at the age of 92 on or about June 14, 1941. "Death followed one week's illness of complications," said the Kokomo Tribune. The funeral sermon was preached by Rev. J.W. Dickison of the Poplar Grove United Brethren Church, assisted by Rev. J.B. Glick with burial in Bell Mound Cemetery. Circa 1941, son Charles and daughter Mrs. Gilbert lived in Ervin Township, with foster daughter Addie Tyler making her home in Parshall, ND. Daughter Clarissa J. Shirar (1852- ? ) was born in about 1852 in Carroll County. On Sept. 1, 1870, in Carroll County, she was united in marriage with William H. Tyler ( ? - ? ). Son Emanuel Shirar (1854-1906) was born in February 1854 in Carroll County, IN. At the age of 20, on April 12, 1874, he wedded Susanna M. Wikle ( ? - ? ) in Carroll County. The marriage is believed to have ended prematurely, and in about 1881 he married again to Mary M. ( ? - ? ). The couple went on to produce five children -- Oliver Shirar, Lillian Shirar, William H. Shirar, Roscoe K. Shirar and Evert M. Shirar. The family relocated in 1888 to a new home in Plymouth, Marshall County, IN, where Emanuel earned a living as a day laborer. The 1900 census whows them in Plymouth. They bought a home on Pierce Street between Michigan Street and the Brownlee Bridge. He obtained work as sexton of the Oak Hill Cemetery at Plymouth, apparently also known as the Jacoby Cemetery. The family was enveloped by heartache in September 1901 when 10-year-old son Oliver died after contracting typhoid fever. Further tragedy rocked the family in December 1906 when 52-year-old Emanuel was at work digging a grave for the late Hannah Riley. He and a helper were placing boards against the sides of the hole to keep the earth from caving in. Reported the Argos (IN) Reflector, he "was being assisted by Sylvester Lovell and had stooped to drive a nail into the eurbing and when he arose fell lifeless against Mr. Lovell, who supposed the man had been overcome by some derangement and applied all available means to restore consciousness but failing in this he summoned assistance and removed the body from the grave. The cause ascribed for the sudden demise was valvular disease of the heart." The funeral, said the Plymouth Weekly Republican, "was very largely attended." The Weekly Republican ran obituary stating that Emanuel "was conceded the best man for the position ever employed" at Oak Hill Cemetery. He was honest, industrious, temperate and in every respect a model citizen. His death cast a gloom over the entire city and the family have the sympathy of everybody in Plymouth.... He leaves also a sister and a brother in Dakota, and a sister at Rushville, Ind." Funeral services were officiated by Rev. O.F. Landis. Son Henry Shirar (1859- ? ) was born in October 1859 in Carroll County. Son Harvey Shirer (1863- ? ) was born in about 1863 in Carroll County. Daughter Elizabeth Shirer (1825- ? ) was born in about 1825 in Adams Township, Muskingum County. At the age of 21, she and her family left Ohio and became pioneer settlers of Indiana, locating in Carroll County. On Feb. 28, 1850, in Carroll County, she and Pennsylvania native Israel Plank (1826- ? ) were joined in matrimony. The couple is known to have produced two offspring -- Atta C. Plank and Otis L. Plank. Circa 1860-1880, the Planks made their home in Burlington, Carroll County, where Israel was a blacksmith and farmer. Sadly, Elizabeth is believed to have died in the 1872-1880 window of time, sometime after her son Clyde was born in 1872. When the federal census was taken in 1880, Israel was marked as widowed and headed a household of daughter Wilhelmina and son Clyde as well as 25-year-old farm laborer Israel Shirey. Daughter Atta C. Plank (1852- ? ) was born in about 1852 in Indiana. At the age of 18, unmarried, she lived at home and earned a living as a school teacher in Burlington Township, Carroll County. Son Otis L. Plank (1857- ? ) was born in about 1857 in Indiana. Daughter Wilhelmina R. Plank (1861- ? ) was born in about 1861 in Burlington Township, Carroll County, IN. Son Clyde Plank (1872- ? ) was born in about 1872 in Burlington Township, Carroll County, IN. Son George W. Shirar (1825-1916) was born on Oct. 15, 1825 in Adams Township, Muskingum County. He was age 20 when he and his parents first relocated in mid-October 1845 to Carroll County, IN. They returned to Ohio in the spring of 1846 to sell the family farm. After the father had held the sale, the household goods were loaded on a wagon and the trip overland from Ohio to Indiana was made by wagon. The family arrived in Carroll county on November 19, 1846 when George ... was twenty-one years old. He remained at home with his father, having taken a contract to drain the land at forty-five cents per rod, subsequently cultivating the home place, until the spring of 1847, after which for some time he worked for a neighboring farmer. Later, he bought forty acres of land and cleared and improved it. On March 21, 1850, he married Virginia native Susanna Craig (1829- ? ) in Carroll County. She was the daughter of Allen and Catharine Craig whose earlier migration went from Virginia to Preble County, OH and thence to Carroll County. Their known children were George F. Shirar, Lydia Cline, James Shirar, Esther Ann Shirar, Israel Shirar, Isaiah Shirar, Mary J. Shirar, Esther A. Shirar, Charles A. Shirer, Hannah Stewart, Eli Shirer and Allen Shirer. Not long after marriage, George traded his 40-acre tract for an 80-acre tract of his father's In 1860, they lived on a farm next to George's brothers Thomas and Levi in Camden, Monroe Township, Carroll County. Having joined the Lutheran church in Ohio, George in 1848 transferred his membership of the Lutheran Church of Camden, IN, and over the years he was an active volunteer and an elder. Susanna became a member of the congregation on Feb. 23, 1852. They also were members of the local Grange. George was a staunch Republican in politics and cast his vote for Abraham Lincoln in 1860. 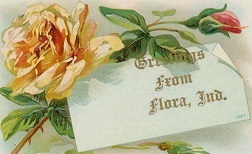 George was named in the Hoosier Democrat newspaper of Flora, IN in 1913 in the obituary of his brother Peter, which said that George was the only surviving member of the family. Circa 1915, their retirement home was along Route 2 near Bringhurst, IN and owned 54 acres in Burlington Township. George was swept away by the Grim Reaper at the age of 91 on April 16, 1916 in Burlington Township, Carroll County. Summarized the History of Carroll County: "The greatness of a community or state depends not so much on the machinery of government or institutions, as upon the sterling qualities of individual citizens and their capacity for unselfish efforts and devotion to good work. The venerable George W. Shirar...may be regarded as one of the pioneers of Carroll county, Indiana, [and] during his long life has stood steadfastly for the right and has remained an invincible foe of the wrong." The Shirars were named many years later in a genealogical query published in the Indianapolis Star (June 27, 1976), submitted by Mrs. Pat Million, R.R. 2, Box 24, Monticello, IN, 47960. Flora's Center Street showing the post office (far left) and awning-covered stores of the Vorhees Bros. and a shoe store, early 1900s. Daughter Lydia Shirar (1852-1937) was born on Jan. 11, 1852 in Carroll County, IN. On Jan. 28, 1873, just a few weeks after her 21st birthday, she was united in holy wedlock with William Henry Cline ( ? -1936). The wedding ceremony took place in Carroll County. The couple dwelled in Flora, IN and produced four children, two sons and two daughters -- Charles Cline, Asa Cline, Bertha Wilsey and Myrtle Cline. William died in 1936. Lydia only survived him by about a year. She entered eternity at the age of 95 on Feb. 22, 1937. In an obituary, the Logansport (IN) Pharos-Tribune called her a "pioneer citizen of Flora" and said she was survived by 12 grandchildren. An obituary also appeared in the Kokomo Tribune. Funeral services were held at the Church of the Brethren in Flora, with Rev. D.W. Shock officiating. Her interment was in Maple Lawn Cemetery. At the time of Lydia's passing, sons Charles and Asa both resided in Camden, with daughter Bertha living north of Flora and daughter Myrtle still at home. Son Israel Shirar (1855-1944) was born on Dec. 9, 1853 (or 1855) in Carroll County. He married Florence Stewart (Oct. 5, 1860-1938), a resident of Camden, IN and the daughter of Samuel and Sarah (Porter) Stewart. Among their children were Floyd Z. Shirar, Lula Coleman and Uvenia Syvilla Vorwerck. Over the years, Israel worked as a furniture finisher in Logansport, Cass County, IN and possibly also in Elizabethtown, KY, retiring in about 1916. Tragedy shook the family in the dead of summer 1917 when 35-year-old son Floyd, a professional photographer in Cincinnati, succumbed from heat stroke on Aug. 9, 1917. Further heartache wrapped the Shirars when 37-year-old married daughter Lulu Coleman, also of Cincinnati, and stricken with sigmoid cancer, died on Aug. 23, 1924 and was interred in Mason, OH. In about 1927, the Shirars moved into the residence of their married daughter and son in law Uvenia and Alfred Vorwerck in Dayton, Montgomery County, OH. Their postal address in Dayton in the 1930s was 2735 Martel Drive. Sadly, having endured chronic heart valve disease, Florence died at the age of 77 on May 4, 1938. Israel began suffering from hardening of the arteries in 1932. He also was burdened with heart disease. At the age of 90, now senile, he passed away on Jan. 20, 1944 at home. Burial was with his wife in Mt. Zion Park Cemetery, with son in law Alfred Vorwerck signing the official Ohio certificate of death. Their daughter Uvenia suffered for two decades with multiple sclerosis and died at the age of 49, in Miami Valley Hospital in Dayton, on Aug. 26, 1950. Son James Shirar (1854- ? ) was born in about 1854 in Monroe Township. Daughter Esther Ann Shirar (1855-1861) was born on Jan. 29, 1855 in Monroe Township. Sadly, she died at the age of six on Feb. 22, 1861. Her tender remains were interred in the Shirar and Landis Cemetery in Monroe Township. Son Isaiah Shirar (1858- ? ) was born in about 1858 in Carroll County. He married Florence M. Stewart ( ? - ? ) on June 19, 1889 in Carroll County. Daughter Mary J. Shirar (1859- ? ) was born in about 1859 in Carroll County. Son Charles A. Shirer (1862- ? ) was born in about 1862 in Carroll County. On March 15, 1883, he was united in holy wedlock with Maggie I. Stewart ( ? - ? ) in a ceremony held in Carroll County. Daughter Hannah Shirer (1863- ? ) was born in about 1863 in Carroll County. At the age of 20, on July 17, 1883, she married William J. Stewart ( ? - ? ) in Carroll County. Son Eli Shirer (1867- ? ) was born in about 1867 in Carroll County. On Aug. 26, 1892, he was united in matrimony with Susan "Susie" Stewart in Carroll County. Son Allen Shirer (1870- ? ) was born in January 1870 in Carroll County. Son Peter Shirar (1828-1913) was born in about 1828 in Adamsville, Salem Township, Muskingum County. He grew up knowing and playing with his first cousin Peter Gaumer. In 1846, when he was age 18, he traveled with his family to Indiana and put down roots in Carroll County. He joined the Lutheran Church of Camden, IN in 1848. In adulthood, he stood 5 feet, 9½ inches tall and weighed 136 lbs. He had a dark complexion, greye eyes and dark hair. On June 1, 1854, the 26-year-old Peter was united in marriage with 19-year-old Sarah Lowman (1835-1898) in Carroll County. The couple produced eight children, of whom six are known -- Perry Shirer, Lewis Shirer M.D., Martha J. Arion, Joseph Shirer, William Shirer, Mary Shirer and two unknowns. Sadly, son William died at age 7 months on Jan. 5, 1873, with interment in the Shirar and Landis Cemetery in Flora, IN. During the Civil War, Peter was a soldier with the 72nd Indiana Infantry, Company A. He enlisted on July 15, 1862. Among his bunkmates and messmates in the company wereThomas Kline, Daniel Kline, John R. Landis and Frederick Landis. He and the regiment were stationed in November 1862 at Scottsville, KY and undertook a march from Frankfort to Bowling Green, KY in pursuit of General Bragg's Confederate forces. During that march, Peter came down with rheumatic fever. He later said that the illness "was caused by laying in the snow and mud on the march. There were six inches of snow on the ground when we left Frankfort." Then in March 1863, while on duty at Murfreesboro, TN, began to complain of camp diarrhea and hemorrhoids which were "so bad he could not stand riding (as we were mounted)," recalled fellow soldier John M. Barnard. He also came down with vertigo at about that time. "I became perfectly blind and once or twice I fell when I was at Murfreesboro," he wrote, "and many a time since." In June 1863, too infirm for active duty but not so disabled that he could no longer be of some service, he transferred into the 8th Veteran Reserve Corps (VRC), Company I. His messmates and bunkmates in the new regiment were Thomas Kline, Alonzo Grover, Fordyce A. Cady, Simpson Montgomery Lyondon, Martin B. Peterson, John A. Peerson, Albertus Parker and John Foster. The regiment was in Elmira, NY in July 1863 and in Chicago in the spring of 1864. While practicing skirmish maneuvers in the fall of 1864, at Camp Douglas, IL, near Chicago, he began having vision trouble with his left eye. He mustered out with the regiment at Douglas on July 24, 1865 and returned to Carroll County, where he spent the remaining six decades of his life as a farmer. ... one of the honest, frugal farmers of Jackson township, for fifty years. He made a little money each year during his active life, and saved a part of it. When he was compelled to give up active management of his affairs he owned 160 acres of as good land as there is on earth and it was all in the very best of condition, being perfectly drained and fenced and a fine set of buildings on it. He didn't acquire it quickly, in fact his whole life was spent in gathering together this competency, but every dollar that went into the Peter Shirar farm was untainted with falsehood, dishonesty or greed, and when the final judgment is passed upon the life of this man it will be that it was "clean and pure" and that the world is better for his having lived. He and his first cousin Peter Gaumer, living nearby, were not on good terms over political differences. On Sept. 17, 1888, he began receiving a Civil War pension for his service [Invalid App. #672.626 - Cert. #492.818] At some point he transferred his church membership to the Lutheran church in Flora. Evidence suggests that Sarah kept to herself and rarely left her home. A Christmas Eve 1897 story in the Seymour (IN) Tribune, headlined "Very Odd Woman," said that she had "visited this place [Flora] but once in 15 years, and only then to attend the burial of a son. She has carriages and horses at her disposal, but prefers to remain at home. It is also said that she has not visited her nearest neighbor, a quarter of a mile distant, for five years." Sarah passed into eternity in Jackson Township, Carroll County on Dec. 8, 1898. Peter outlived his wife by 14 and a half years. One government surgeon who examined him in 1891 said that Peter was "stooped, emaciated: skin dry, somewhat sallow, wrinkled: apparent age greater than real: long, white hair and whiskers -- regular features, average intelligence." At the end of his life, Peter was drawing $30 in monthly pension payments. He died in Flora, Monroe Township, Carroll County on July 25, 1913. Burial was in Maple Lawn Cemetery following funeral services led by Rev. W.D. Cole of the Flora Presbyterian Church. Peter is named in a list of his fellow soldiers in the 1872 book Recollections of the Early Settlement of Carroll County, Ind., authored by Dr. James Hervey Stewart (Cincinnati: Hitchcock and Walden). Son Perry Shirar (1859-1894) was born in about 1859 in Camden, Jackson Township, Carroll County. He was a "well-known farmer" of Flora, IN. At the age of 35, on Aug. 20, 1894, he committed suicide by shooting himself, with the news reported in the Delphos (OH) Daily Herald, Lima (OH) News and likely other newspapers. Daughter Martha J. Shirar (1863-1942) was born in about 1863 in Carroll County. She was wedded to William D. Arion ( ? - ? ) on April 9, 1898, in Carroll County, when she was 25 years of age. Circa 1913, the couple dwelled at Burnetts Creek near Flora, Carroll County. Martha passed away in about 1942. Son Joseph "Joe" Shirar (1865-1944) was born on March 14, 1865 in Jackson Township, Carroll County. In 1913, residing in Flora, Carroll County, he paid $107 in medical bills and funeral expenses for his father, and requested reimbursement from the U.S. Pension Office. He owned a portion of the old Shirar farm circa 1913, located about 2.5 miles northeast of Flora. He was a member of the Lutheran Church in Camden. Joseph apparently did not marry and resided with his sister Mary. He died at the age of 79 in the Cass County Hospital in mid-December 1944. Rev. Stahl performed the funeral service followed by burial in Maple Lawn Cemetery. Daughter Mary "Mollie" Shirar (1879- ? ) was born on Sept. 30, 1879 near Flora, Carroll County. Mollie never married. For many years lived at home with her parents and brother Joseph. She was a member of the Flora Christian Church. In about 1946, she was admitted to the Arzula Flora Nursing Home, and remained there for the rest of her 15 years on earth. Death occurred at the age of 81 on June 7, 1961. Rev Milton Craign preached her funeral sermon, with burial following in the Maple Lawn Cemetery. In an obituary, the Kokomo Tribune said that her only survivors were four nieces -- Mabel Holmes and Maude McNeil of Flora, Lulu Latta of Lafayette, IN and Mrs. Harry Kauffman of Burnettsville, IN. Daughter Mary J. Shirer (1829- ? ) was born in about 1829 in Salem Township, Muskingum County. She was a teenager of 17 when she and her family migrated to Carroll County, IN. At the age of 25, on June 8, 1854, she married John Q. Cline ( ? - ? ). Circa 1916-1946, she dwelled in Flora, Carroll County. Nothing more is known. Son Charles Shirar (1832-1911) was born in about 1832 in Salem Township, Muskingum County. At age 16, he made the journey to Indiana when his family settled on a farm near Delphi in Carroll County. On March 24, 1852, when he was 20 years old, he married Lucinda Barnard (1833-1914) in Delphi, Carroll County. Rev. Jesse Hill of the Methodist Church officiated. Their nine children were William H. Shirar, Mary E. Shirar, Lois Jane Shirar, Marquis de "Lafayette" Shirar, Oliver Perry Shirar, Philip Sheridan Shirar, Ulysses Frank Shirar, Martha Minerva Shirar and Alice Lenore Shirar. Charles stood 6 feet, 1½ inches tall, with a dark complexion, dark hair and blue eyes. He earned a living in his early married years by farming, ditting ditches, splitting rails and clearing land. Charles served in the Union Army during the Civil War as a member of the 46th Indiana Infantry, Company A, a company commanded by Capt. William A. Pigman. He mustered into the army on Nov. 1, 1861. 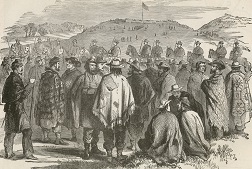 The regiment was on duty at New Madrid, MO in mid-March 1862 when Charles was ordered on a forced march to reinforce the Army at Fort Donelson, TN. He recalled that on the "forced march from Camp Wickliffe to the Ohio river he drank too much cold water + took a sudden cold, then the force went into boats + went down said river + from constant duty + exposure he could get no relief. The forced landed on the Missouri side of the river at New Madrid, + being without shelter more than half the time in drenching rains he could scarcely speak above a whisper." He suffered hearing loss when a 10-lb. parrot gun was fired near his left ear. Then in April 1862, while on a march to Riddles Point, he came down with severe diarrhea at Fort Pillow, TN and after continuing to drink Mississippi River water, he passed blood in his stool. He was treated in a Tennessee state hospital in Memphis in July and August 1862 and then was sent back to his regiment, where the problems only got worse. While in Helena, AR, he was discharged on Oct. 14, 1862 due to disability. After returning home, Charles resided in Delphi, Carroll County. In December 1867, following the close of the Civil War, the family migrated to Kansas, settling on a farm in Waharusa Township, Douglas County. In February 1872, they moved again to Walnut Township, Saline County, KS. He began receiving an invalid pension in 1875. [Invalid App. #199.528 - Cert. #176.739]. One day in August 1879, Charles and friend George Bull were threshing what. Charles was pitching with Bull from the stack and set his fork down and walked away to have a bowel movement. Bull saw him get up and start back and noticed that something was wrong with him and started toward him. Before Bull could get to him, Charles staggered and fell. Said Bull: "I spoke to him but he appeared to take no notice of anything. We applied restoratives to him as soon as we could get them and in course of say half an hour he came too but seemed completely prostrated having no power or indication to move or say anything." Another friend, William Reed, said that in August 1884 "while atending a festavel at a church in the neighborhood, [Charles] was thair but a short time when he told his family that he was feeling verry bad and that he would go home. He had some difficulty in geting to his home. I called to see him on the following morning. I found him laying in his bed. He told me that he had a serious time on the night before. He told me that he happened to have a little whiskey which he drank, he thought that was helping him very much. He did not perform any manuel leighbor for nearly a week after that." The Shirars suffered a loss of property during a tornado which struck Saline County in August 1888. A report in the Saline County Journal said that Charles lost a stable and granary worth $100 and son Perry a buggy worth $25. At some point the Shirars relocated to Texas, and their home in May 1895 was in Runge, Karnes County, TX. By 1898, he was completely disabled from an ability to perform manual labor because of "chronic diarrhea, piles, disease of lungs and eyes, deafness, paralysis and general debility," wrote his former neighbors George Bull and Cade Suran of Gypsum, KS. He walked only with the aid of a cane. Too poor to afford a physician, Charles relied on "Jaynes Medicines" for relief. A case for increasing his pension amount was published in Report No. 3611 of the House of Representatives circa February 1903. The report noted that "he was in a very feeble condition, crippled, and walked with the support of a staff, seeming to have almost lost the use of his lower limbs, and also to be disabled in the left arm and hand; that he converses with difficulty, his tongue seeming to be partially paralyzed; that recently, while standing in his bedroom, he fell over, striking his head on some furniture injuring himself severely; that he had to abandon his occupation, and that he was now totally disabled for any labor." Charles' monthly pension payment was increased to $24 and remained unchanged for the rest of his life. In the early 1910s, their address was 4406 Eli Street in the Brunner addition of Houston, TX. Old friends recalled that he was a temperate man, had no bad habits and was known as a conscientious Christian. When the Shirars' celebrated their golden wedding anniversary in March 1902, the San Antonio (TX) Express published a lengthy article which included sketched portraits of husband and wife. "The occasion was not celebrated with flourish and pomp, as one of the leading rules of this aged couple during their long life has been simplicity, quietly and humbly submitting to adversity and rendering unto their Creator their gratitude for having been given many days that they might fill them with usefulness to their fellow creatures.... 'Grandpa' and 'Grandma" Shirar, as they are familiarly called, are both of cheerful temperament and though many misfortunes have fallen upon them they have always looked upon the bright side of life, which in part, together with their remarkable vitality, accounts for their well preserved years. They early professed religion and are devout memebers of the Runge Methodist church. Grandpa Shirar's greatest delight is in lending his influence in the right bringing up of the young men in his community, while Grandma Shirar is a most genial companion for both old and young, and even the little children consider it a great treat to be allowed to spend the day with Grandpa and Grandma Shirar." Charles passed away at home on Jan. 25, 1911. Physician T.F. Hudson later wrote that "I was not present at the time of his death, his troubles were of a nature that did not require the attention of a physician but the family had arranged with me to be present during his last hours. His death occurred more suddenly than was anticipated hence my absense." After Charles' death, Lucinda began receiving his pension payments discounted by 50 percent to $12. At the time, she resided in Texas. [Widow App. #958.148 - Cert. 724.219] She passed into eternity the day after Christmas 1914. Charles is named in a list of his fellow soldiers in the 1872 book Recollections of the Early Settlement of Carroll County, Ind., authored by Dr. James Hervey Stewart (Cincinnati: Hitchcock and Walden). Son William H. Shirar (1853- ? ) was born on Jan. 20, 1853 in Monroe Township, Carroll County. He married Alberta J. (?). Circa 1902-1906, he dwelled in Runge, Karnes County, TX and in 1906 signed an affidavit in support of his father's Civil War pension claim. Daughter Mary E. Shirar (1855- ? ) was born on March 29, 1855 in Monroe Township, Carroll County. She married and lived in Kipp, Saline County, KS in 1902. Daughter Lois Jane Shirar (1857- ? ) was born on Nov. 24, 1857 in Monroe Township, Carroll County. She was wedded to (?) Reed. Son Marquis De "Lafayette" Shirar (1860- ? ) -- named after the famed French military officer who had won Americans' hearts with leadership and political support during the Revolutionary War-- was born on Feb. 13, 1860 in Monroe Township, Carroll County. Living in Walnut Township near Salina, Saline County, KS, Lafayette and a number of his brothers and cousins in June 1885 joined the Kansas National Guard, Company B. He lived in Matagordo County, TX in 1902. Son Oliver "Perry" Shirar (1862- ? ) -- named after the Naval officer who helped the United States win the War of 1812 -- was born on Aug. 16, 1862 in Monroe Township, Carroll County. When he was age 10, in 1872, he relocated with his parents and family to Saline County, KS. Living in Walnut Township near Salina, Saline County, KS, Perry and a number of his brothers and cousins in June 1885 joined the Kansas National Guard, Company B. He is believed to have married (?) Post ( ? - ? ), a daughter of Civil War veteran Stephen Post of Saline County who moved to Texas in 1892. Their home was in Houston, TX in 1902. In January 1910, Perry accompanied his father in law back to Saline County for the funeral of a relative, but the in-law contracted a deadly case of pneumonia and died there. Perry accompanied the body back to Texas, reported the Salina (KS) Daily Union. Son Philip "Sheridan" Shirar (1865- ? ) -- named after the Union Army commander of the Civil War -- was born on March 29, 1865 in Monroe Township, Carroll County, just a few weeks before the war ended. When he was age seven, in 1872, he relocated with his parents and family to Saline County, KS. Living in Walnut Township near Salina, Saline County, KS, Sheridan and a number of his brothers and cousins in June 1885 joined the Kansas National Guard, Company B. He made his home in Colorado in 1902. Son Ulysses "Frank" Shirar (1868- ? ) was born on Feb. 12, 1868 in Waharusa Township, Douglas County, KS. Living in Walnut Township near Salina, Saline County, KS, Frank and a number of his brothers and cousins in June 1885 joined the Kansas National Guard, Company B. He dwelled in Runge, TX in 1902. Daughter Martha Minerva "Mattie" Shirar (1871- ? ) was born on Aug. 24, 1871 in Waharusa Township, Douglas County, KS. She was joined in wedlock with (?) Taylor ( ? - ? ). Circa 1902, they lived in Texas. Daughter Alice Lenore Shirar (1876- ? ) was born Sept. 8, 1876 in Waharusa Township, Douglas County, KS. She was married to (?) Neal ( ? - ? ) and in 1902 resided in Runge, TX. Son Lewis Shirer (1836- ? ) was born in 1836 in Salem Township, Muskingum County. He was age 10 when he and his family were pioneer settlers of Carroll County, IN. He is shown with his parents living in Camden, Jackson Township, Carroll County in 1860 census records. After the Civil War erupted, he joined the Union Army, but sacrificed his life. Details are not yet known. Daughter Rebecca Ann Shirer (1838- ? ) was born in 1838 in Salem Township, Muskingum County. As a girl of age eight, she traveled with her parents, brothers and sisters to Indiana and lived in Carroll County. When she was 20 years of age, on Jan. 6, 1859, she was joined in the bonds of wedlock with Eli Shafer (1828- ? ), a native of Pennsylvania. The couple produced nine children -- Charles R. Shafer, Emma Shafer, Louis Shafer, Henry S. Shafer, Mary J. Shafer, John F. Shafer, Jessie A. Shafer, Orley Shafer and Inez C. Shafer. In July 1898, residing in Jackson Township, Carroll County, she gave a deposition to a government investigator in the Civil War pension case of her brother Peter. Son Charles R. Shafer (1859- ? ) was born in December 1859 in Jackson Township, Carroll County, IN. Daughter Emma Shafer (1862- ? ) was born in 1862 in Jackson Township, Carroll County, IN. Son Louis Shafer (1864- ? ) was born in 1864 in Jackson Township, Carroll County, IN. Son Henry S. Shafer (1866- ? ) was born in 1866 in Jackson Township, Carroll County, IN. Daughter Mary J. Shafer (1869- ? ) was born in 1869 in Jackson Township, Carroll County, IN. Son John F. Shafer (1871- ? ) was born in 1871 in Jackson Township, Carroll County, IN. Daughter Jessie A. Shafer (1873- ? ) was born in 1873 in Jackson Township, Carroll County, IN. Son Orley Shafer (1875- ? ) was born in 1875 in Jackson Township, Carroll County, IN. Daughter Inez C. Shafer (1879- ? ) was born in 1879 in Jackson Township, Carroll County, IN. We are grateful for records provided by Gilbert R. Gaumer, Paul K. Gaumer, Mary L. Shirer and the National Archives in the preparation of the Daniel Gaumer Sr. family biographies.